The Napoleon Woodland Series Electric Log Sets give you the ambiance and look of real burning logs. The hand-painted resin logs have been molded from actual burned wood, giving them a realistic appearance. The electric log set insert does not require any special installation, and can be plugged directly into a 120 volt outlet, or may be hard-wired. Because it is electric, there is no need for ventilation for this fan-forced heater. The included remote controls 6 temperature settings as well as a timer. The remote will also control the LED lighting for the flame show and the ember bed. Napoleon warrants electrical components and wearable parts such as fans/heaters, motors, switches, nylon bearing components and remote controls for a period of one (1) year. If you’re looking for the convenience of an electric fireplace and the look of real logs, look no further than the Napoleon Woodland Series Electric Log Set. Hand-painted resin logs, molded from actual burned wood, lend a realistic appearance to this log set. Also, there are no special installation parts or ventilation needed, making these logs easy to install. Producing up to 5,000 BTUs, the Napoleon Woodland Series Electric Log Set has two different heat settings. Finding the perfect temperature for your space is easy with 6 different temperature options. We love that you can also control the LED flame lighting and ember bed intensity through the remote, allowing you to customize the log set each time you use it. There is no special installation required – simply place into an existing opening, plug into a standard 120 volt outlet, and this electric log set is ready to use. 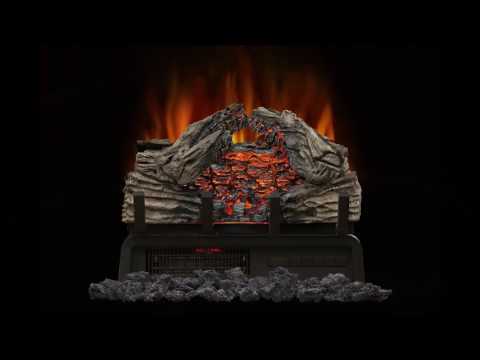 This electric log set is meant to be placed in an existing fireplace. Will this work in a see through fireplace? This Electric Log Set is not designed for see through fireplaces.